Do you want to get more blog readers using Facebook? Facebook Instant Articles delivers an incredibly fast reading experience for your visitors on Facebook. In this guide, we’ll walk you through how to set up Facebook Instant Articles in WordPress. Facebook Instant Articles is a project by Facebook that allows publishers like you to distribute your posts on Facebook, so your visitors can access pages faster than standard mobile web articles. To deliver your content almost instantly to your visitors on Facebook, Instant Articles loads a stripped-down version of your site in the Facebook mobile app. Incredibly fast reading experience: You can deliver your content to readers almost instantly in the Facebook app. Less likely to abandon: Because the pages are delivered super fast, readers are 70% less likely to abandon your articles. Attract more visitors: On average, people on slower connections read 20% more instant articles than mobile web articles. 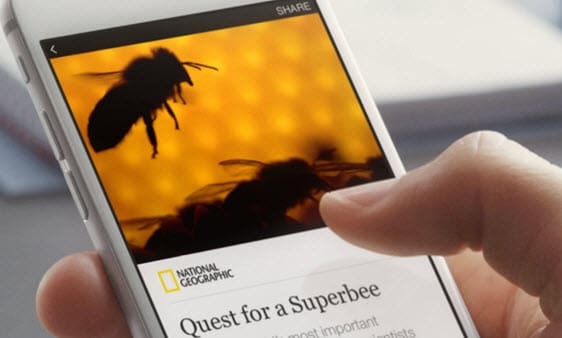 Should You Enable Facebook Instant Articles for Your Site? You should enable Facebook Instant Articles if you’re a publisher who wants to drive more Facebook visitors to your blog. It’s not for you if your website doesn’t have a blog or a latest news section on your website. Instant Articles are stripped down version of your website. You shouldn’t enable Facebook Instant Articles on your landing pages in which conversion is the main objective because the stripped down version would defeat the purpose of your original design. The first thing you need to do is to visit Facebook Instant Articles and click on the Sign Up button to get started. Choose the right page from the list in which you want to enable Instant Articles. 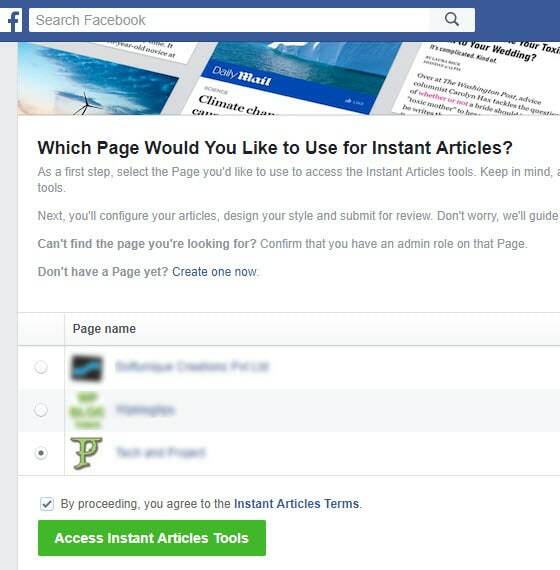 Then agree to the Instant Articles terms and click Access Instant Articles Tools. Then click Continue. Now you’ll be sent to the Publishing Tools section of your selected Facebook page. Here, you need to prove the ownership of your website by claiming your URL. Scroll down your page until you find Tools. Now click the Connect Your Site section to expand it. 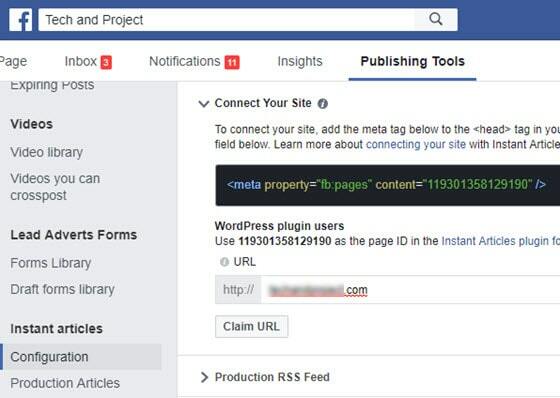 Facebook will now show you a code snippet, which you should insert into the header section of your WordPress site. 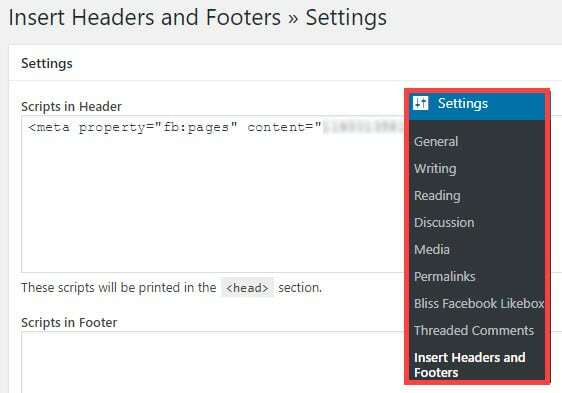 The easiest way to add the snippet to your head section is by using Insert Headers and Footers plugin. If you need assistance, see the step by step guide on how to install a WordPress plugin. Once the plugin is activated, navigate to Settings » Insert Headers and Footers and insert the code into the header section. Then, click Save. Now go back to your Facebook account and enter the URL of your site and click on the Claim URL button. 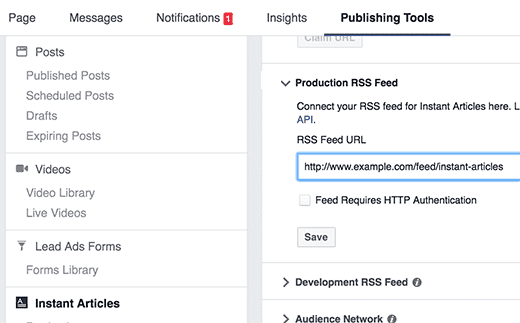 Copy the feed URL from your address bar and insert it into the RSS feed URL field inside the Production RSS feed section. Don’t forget to click Save. In your WordPress dashboard menu, click on Instant Articles. You’ll be directed to the plugin’s settings page. Now you need to enter your Facebook page ID. 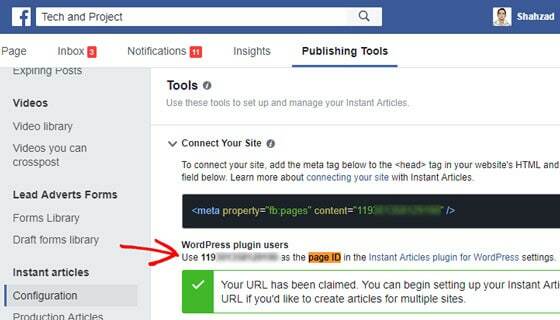 Go back to Publishing Tools and get the Facebook Page ID below the Tools section. Return to your WordPress dashboard, enter the Page ID and click Save. 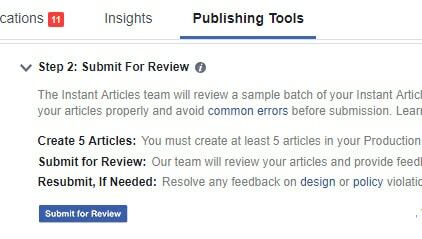 After the configuration, go back to your Facebook account and submit your Instant Articles feed for review. All you need to do is click the Submit for Review button. The Facebook team will review your articles and provide feedback within 1-3 business days. Now that you’ve successfully created and submitted Instant Articles, it’s important to add Google Analytics to it. Google Analytics tracking helps you understand how your visitors interact with your Instant Articles. 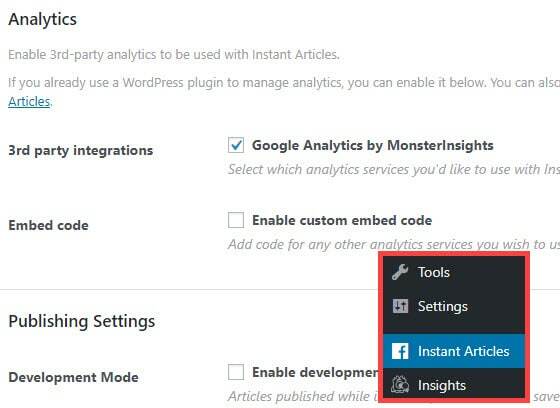 In the settings page of the Instant Articles for WP plugin, you can find a section named Analytics. In this section, you can manually enable Google Analytics on Instant Articles by adding custom code. The problem with manual Google Analytics setup for Instant Articles is that the title of your Instant Articles are typically shown as “not set” in your Google Analytics account. 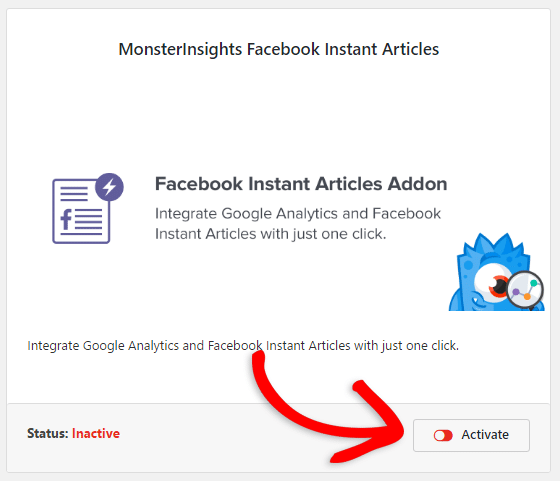 The easy way to properly track your Instant Articles with Google Analytics is by using MonsterInsights. Besides accurate tracking of your individual Instant Articles pages, you can also track the performance of your ads, outbound clicks and utilize other MonsterInsights features. First off, install and activate MonsterInsights, and connect it with your Google Analytics account. Learn how to properly connect MonsterInsights with Google Analytics. 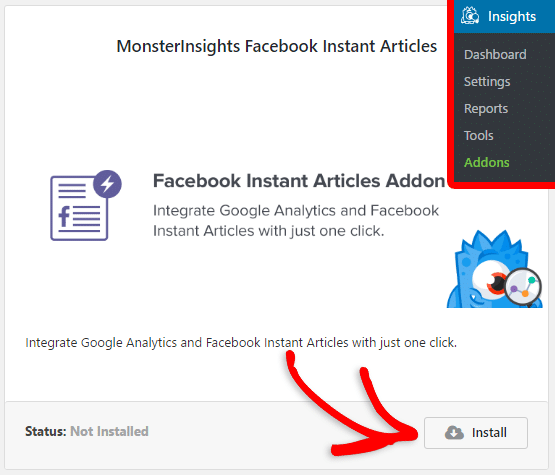 Now go to Insights » Addons and click Install under the MonsterInsights Facebook Instant Articles addon. 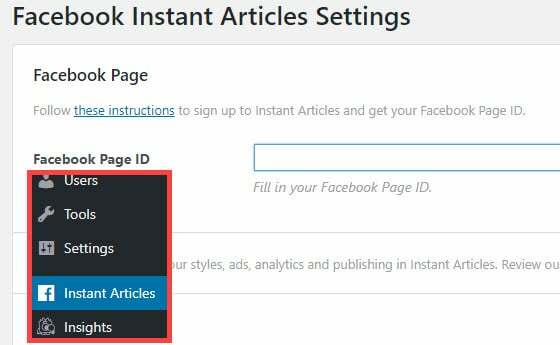 Now go back to the settings page of Instant Articles for WP by clicking the Instant Articles menu in your admin panel. In the Analytics section, you can find Google Analytics by MonsterInsights as third party integration. Click the checkbox to enable it and click Save Changes. You’ve successfully set up Instant Articles for your site and submitted for review. You’ve also added Google Analytics to your Instant Articles. If you liked this article, you might also want to check out how to add Google Analytics to your AMP pages. And don’t forget to follow us on Twitter and Facebook for more Google Analytics tutorials.